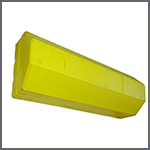 We proudly manufacture Polyurethane Wheel Chocks to suit a variety of wheel diameters. 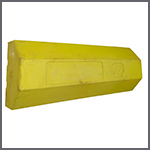 This high strength polyurethane wheel chock is designed to keep heavy commercial vehicles and semi-trailers in place. 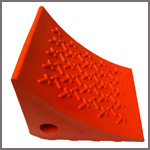 Its high-strength polyurethane construction will withstand years of use. 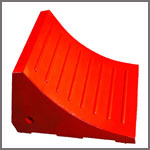 Our Wheel Chocks provide a safe and convenient method of preventing unwanted vehicle movement during park up, servicing and breakdowns. We have developed a series of different models, specially designed for large mining trucks & vehicles, medium vehicles and light vehicles. Bright orange for greater visibility. Incoming and outgoing drivers can easily see chock for added safety. 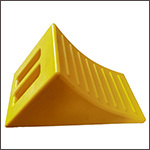 Safety tread on chock face provides better grip and reduces slippage. Use only after vehicles is completely stopped and parking brakes fully applied. Center chocks snugly and squarely against tread of each wheel. Always test chocks to insure they meet requirements.